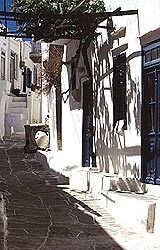 Other sites of historical and cultural interest include the old schools of Saint Artemios (1832-1988), the church of Saint Artemios (1629), which belongs to the Simonopetry of Mount Athos, the Virgin Mary of Barou with the French frescoes and wood curved temple the churches Saint Athanasios, Saint Sostis, the Transfiguration of Christ, the Holy Cross and the Bearded Virgin ''Uraniofora'', the busts of poet Rambaya in the square of the same name and that of Aristomenis Provelengios, made by the famous Tinian sculptor Giannoulis Halepas, in the courtyard of the Gymnasium. South-west from Apollonia, on the highest peak of Mount Prophet Elias, visitors can see the imposing monastery of the same name (1145-1890), where many of the monks were iconographers; those who enjoy hiking will never forget the panoramic view of the Aegean and the scenic way in which the island's many villages punctuate the soft contours of the hills across from Mount Prophet Elias. On the north slope of the same mountain, visitors can also see the Monastery of Saint John tou Moungou (the Mute) (ca. 1650-1834), where Parthenios Heretis, a monk well known for his intellectual and scholarly pursuits, lived and worked.